Caitlin Piccarello Strauss is a litigator who represents companies in disputes involving insurance, employee benefits and ERISA, real estate, and restrictive covenants. Caitlin understands from her secondment as an in-house attorney for a Fortune 100 insurance company the value clients place on finding cost-effective solutions to resolve disputes. As a result, she approaches litigation with the goal of providing strategic and practical advice that balances dispute resolution with mitigating risk. Caitlin is a leader of the Firm's Employee Benefits and ERISA Litigation team. Insurance companies rely on her to defend them in coverage disputes particularly involving claims for benefits under group employee benefits policies governed by ERISA. The litigation experience Caitlin has gained from representing insurance companies dovetails with her experience litigating commercial disputes involving food, beverage and consumer products companies. 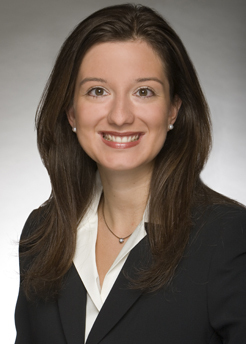 Caitlin also serves as co-chair of the firm's Food & Beverage Practice. Caitlin represents clients in the real estate industry as well and defends property managers, real estate brokers and agents in professional liability disputes stemming from residential and commercial real estate transactions. She also represents title insurance companies and their insureds in cases involving title insurance claims and title agent defalcations. Caitlin is a leader and advocate for the development and advancement of women attorneys both inside the firm and in the larger legal community. As a founding member and co-chair of Saul Ewing Arnstein & Lehr's Women's Development Initiative (WDI), she provides women attorneys with opportunities for networking and business development. She also serves as chair of the Philadelphia Bar Association's Women in Law Firms Initiatives Task Force and regularly participates in panel discussions about women's initiatives in law firms. Caitlin represents insurance companies and insurance brokers, including a large international insurance broker, in coverage-related disputes and claims of professional malfeasance. She also represents insureds, including food manufacturers, on covered claims involving D&O and CGL policies. Caitlin has managed coverage disputes involving group employee disability policies nationwide. Her experience includes defense of over 100 group and individual life, health and disability cases (both ERISA and non-ERISA) for the country's leading insurers. Caitlin has particular experience defending these cases in the Third Circuit and federal courts therein. Caitlin co-edits Saul Ewing Arnstein & Lehr's monthly Friday Five which keeps the industry apprised of developments in ERISA litigation. Residential and commercial real estate transactions, particularly with first-time buyers or sellers can result in litigation risk for real estate brokers and agents. Caitlin has successfully defended and obtained dismissal of these cases. Caitlin has also secured injunctions and recovery for title insurance companies in cases involving title agent defalcations and represented insureds in title insurance claims. Caitlin has represented employers in a variety of employment litigation matters with a particular emphasis on non-compete agreements and employee raiding claims for the financial services and insurance industries. Caitlin has represented clients in the food and beverage industry in matters involving premises liability, products liability and breach of contract. Piccarello named "Lawyer on the Fast Track"
Smooth Move. Switching Firms? Consider Your Legal Risks First. Publication, "Comment: Terrorism, Tourism, and Torts: Liability in the Event of a Terrorist Attack on a Sports or Entertainment Venue"